The HIT Alumni Association – ‘ HIT Achievers’ offers an opportunity to our alumni to remain in touch with their alma mater. HIT has a strong bond with the Alumni since its inception. HIT Alumni Relations Cell strengthens the fraternity bond between the alumni and the institute and creates a common platform for greater interaction. It facilitates professional and personal networking among alumni by organizing various events including alumni reunions, coffee meets, and other activities to let alumni relive their memories. HIT shares a strong bond with its alumni who have risen to senior positions in India and abroad and who provide full support to our team round the year. 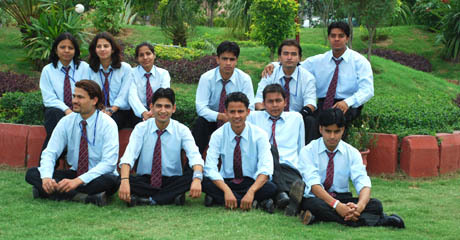 All students automatically become life-members of the – ‘ HIT Achievers’. The Alumni Affairs Committee takes care of the activities, under the close supervision of the PTC. I am grateful to Himalayan Institute of Technology- its faculty and the Training & Placement Department. They've made efforts ensuring maximum number of placements to students. Himalayan Institute of Technology provides a great platform for skills enhancement a great learning experience. It was the result of the holistic education provided by HIT only that I was amongst the first few students who got placed even before completing the course. I got a placement in ICICI as executive – Business Development & Client Service and am placed at Mumbai with a decent package and many more facilities. I shall always remain indebted to HIT for this. All these years at Himalayan Institute of Technology have been the best years for learning and gaining exposure to fields relevant to my discipline. The all could happen due to my faculty members. Thanks to the Training & Placement Department of HIT. This endeavor, I am sure will lead our institute to incredible heights. HIT campus is full of positive energy and exuberance. There are limitless opportunities to discover yourself. Besides that, this college gave me sweet memories, faithful friends and a sense of confidence to face the challenges and turbulence in life. All 3 years at HIT were golden days. that I will cherish throughout HIT it gave me many good friends and best teachers. The moments with them will last lifetime. On coming to this campus only I came to know so many hidden qualities about me. HIT gave me true hearted friends, helping professors instituting confidence in me to face different situations in my life. Its infrastructure spreads a positive energy because of which every HIT student is always encouraged to search for new vistas for progress in his/her life. HIT provided me perfect platform for skill development as well as personality development. The instruments, labs, libraries are of superb quality and have everything that one needs to gain in-depth knowledge in one’s field of interest.I am proud to be a student of HIT. HIT for me was a place where I had the best mentors to guide me through. At HIT I always found teachersreadyto guide me. My mentors at HIT gave me a chance to express myself in a best way. It is a place where you are not criticized for your failures but at HIT it is your journey from failure to success. I miss My HIT . The three years that I spent in HIT have taught me patience, endurance and humility while giving me a sense of belonging at the same time. I am proud to have been a part of HIT, and given a chance to travel back ever in future, I will be only happy to visit HIT and cherish my old memories.